The Democratic Republic of Congo has sworn in opposition leader Felix Tshisekedi as the newly elected President of the country. Thursday’s swearing-in ceremony marks the first time DR Congo would witness a peaceful power transition since its independence. The country DR Congo has not seen a peaceful transfer of power since independence from colonial Belgium in 1960, a dismal history, many feared could repeat itself in the face of the growing tension over election results. However, the swearing-in ceremony will likely put such fears to rest in the coming days. In his speech before a cheering crowd of supporters on Thursday, Tshisekedi said that the country will not be one of “division, hate or tribalism”. “We want to build a strong Congo in its cultural diversity. We will promote its development in peace and security. A Congo for each and everyone, where everybody has his or her own place,” he said. Tshisekedi’s ability to lead the Central African country would be in the spotlight, especially with many Congolese nationals hoping for a new lease of life with the ouster of President Joseph Kabila who had been in power since 2001. Whether or not the newly elected president can meet the mounting expectations for his government remains unseen, especially with the event that characterized his inauguration in Kinshasha, the capital. Tshisekedi reportedly “collapsed for few minutes while giving his speech during Thursday’s inauguration. Al Jazeera’s Fahmida Miller, who was at the inauguration in the capital Kinshasa, reported that the newly elected President “collapsed on the podium”, but was able to resume his speech after a few minutes. 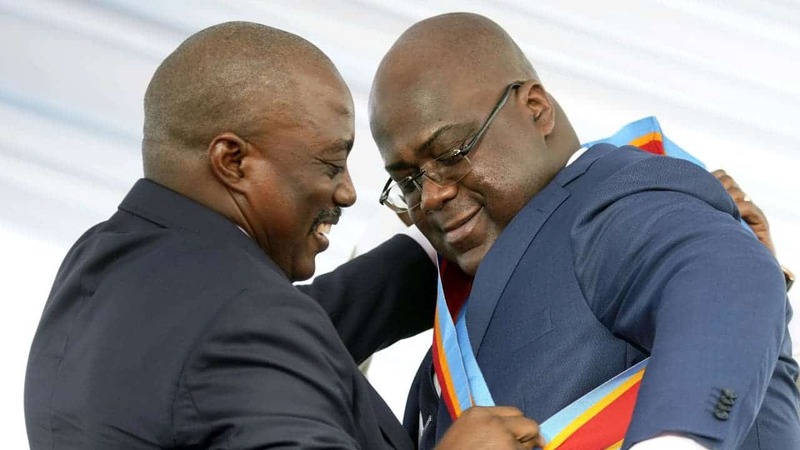 Tshisekedi’s victory at the December 30 poll has been dominating political discussions in the country. In a highly disputed election result, the country’s electoral commission had declared Tshisekedi winner of the country’s presidential elections held on December 30. The election results as announced by the commission showed that Tshisekedi won the election with 38.57 percent of the total votes cast. A breakdown of the election results revealed that he received more than seven million votes compared to 6.4 million for Martin Fayulu, who came second in the tightly contested election. President Kabila’s preferred candidate at the election¸ Emmanuel Ramazani Shadary polled about 4.4 million votes to emerge third. The newly elected President’s primary task would be to unite various opposition parties in the country and to engage them to chart a common course for the nation’s socio-economic development.